Railpictures.ca - sdfourty Photo: Over the years VIA Rail attempted several transcontinental train combinations, all with cost savings in mind. The first major change occurred after the late summer 1978 take over of CP Rail passenger service. Via initially settled on the ex CP Rail The Canadian equipment to operate on CP track to/from Montreal through Sudbury, Calgary, Banff to Vancouver and the ex CN Super Continental equipment to operate on CN to/from Toronto via Capreol, Sioux Lookout, Edmonton, Jasper to Vancouver. So witness here the passenger equipment transition to the arrangement as described above: a late and rather under powered Via CP train #12 coming off the Galt Subdivision ( the Mactier Subdivision ends at West Toronto) at Cabin D ( west of Bathurst Street) with CP Rail power (8529 -8423; a GP9 – RS10 ) and (ex CN) Super Continental equipment – all fourteen cars! Presumably this equipment operated on CP through from Winnipeg, the closest CP-CN passenger interchange location. Perhaps CP Rail\’s input on this avoided placing the ex CP passenger 1400 series locomotives ( FP7A / 9 A\’s) to pull the ex CN equipment on CP! And yes that is the on time – 8:35 p.m. Union arrival time – Buffalo Budds Via CP Rail train # 322 ( RDC-3\’s #9023 and 9024) being held for the four plus hour late #12. The time of this negative exposure is 8:30 p.m. on a Sunday September evening, the available light was very poor and add to that this is Kodak TriX 400 ASA pan film – hence please accept (excuse if you will) this unique full frame, low contrast and somewhat grainy exposure (the latter the train is the longer you wait!). It would be some six plus years before Toronto would see the ex CPR Budd equipment again. Kodak Tri X Pan b&w negative film. Photographer S.Danko. | Railpictures.ca – Canadian Railway Photography – photographie ferroviaire Canadienne. Caption: Over the years VIA Rail attempted several transcontinental train combinations, all with cost savings in mind. The first major change occurred after the late summer 1978 take over of CP Rail passenger service. Via initially settled on the ex CP Rail The Canadian equipment to operate on CP track to/from Montreal through Sudbury, Calgary, Banff to Vancouver and the ex CN Super Continental equipment to operate on CN to/from Toronto via Capreol, Sioux Lookout, Edmonton, Jasper to Vancouver. So witness here the passenger equipment transition to the arrangement as described above: a late and rather under powered Via CP train #12 coming off the Galt Subdivision ( the Mactier Subdivision ends at West Toronto) at Cabin D ( west of Bathurst Street) with CP Rail power (8529 -8423; a GP9 – RS10 ) and (ex CN) Super Continental equipment – all fourteen cars! Presumably this equipment operated on CP through from Winnipeg, the closest CP-CN passenger interchange location. Perhaps CP Rail\'s input on this avoided placing the ex CP passenger 1400 series locomotives ( FP7A / 9 A\'s) to pull the ex CN equipment on CP! And yes that is the on time – 8:35 p.m. Union arrival time - Buffalo Budds Via CP Rail train # 322 ( RDC-3\'s #9023 and 9024) being held for the four plus hour late #12. The time of this negative exposure is 8:30 p.m. on Sunday June 17 (Fathers Day) *:30 PM, the available light was very poor and add to that this is Kodak TriX 400 ASA pan film – hence please accept (excuse if you will) this unique full frame, low contrast and somewhat grainy exposure (the latter the train is the longer you wait!). It would be some six plus years before Toronto would see the ex CPR Budd equipment again. Kodak Tri X Pan b&w negative film. Photographer S.Danko. The INGLIS sign was removed this week.. for good..
Beautiful shot. As for the date… look at the Inglis billboard beyond the Budd cars. Unless the digital text hadn’t been updated, this shot would have had to be on, or slightly before, Father’s Day, in June. Trailing unit might be CP 8473. 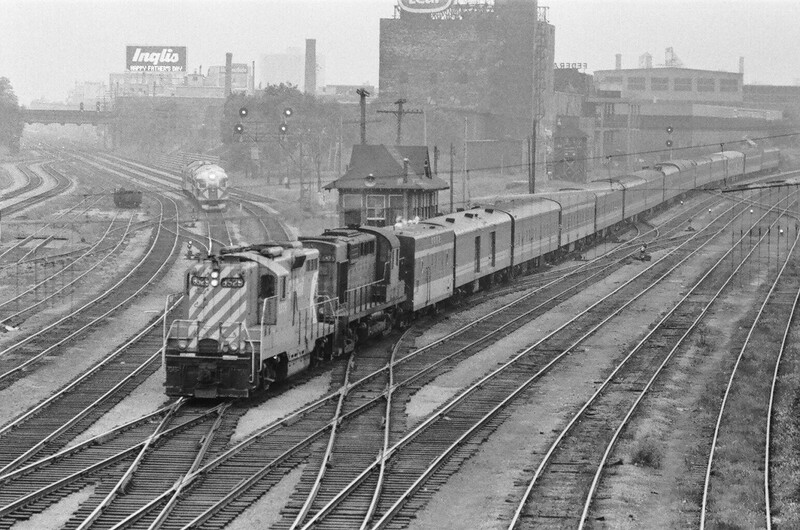 CP 8423 was a GP7. Very Interesting. I didn’t know that CP’s passenger geeps ever made it this far east! The correct date is June 1979 – the third Sunday! Steve, in your caption you say this shot was taken in Sept 79 but the Canadian stopped running on June 17 1979. Can you clarify the date? If it was Sept, this is likely a detour over CP. Either way, it’s an amazing shot – very interesting look into the early VIA consists on the transcon. What a fantastic scene, and dated perfectly with the Inglis sign.